You might have thought that bulletproof, jet-powered, advanced technology integrated superheroes with colourful super awesome outfits exist only in movies, but it is time to reconsider. Now such type of superheroes are a reality and Emily is the first one to achieve such colours. Emily is actually a man-made wonder and got the name through simplification of Emergency Integrated Lifesaving Lanyard. Yes, Emily is a robot designed to be thrown out into the ocean and facilitate the rescue operation autonomously without any assistance from humans. Emily can zip through the waves at a speed of 22 mph and is made up of Kevlar (aircraft grade composite) which is literally indestructible. Emily, at just 4 feet long and 25 pounds weight can carry up to six people struggling in water and can also deliver life jackets to the people in need without any hassle. Already 260 of them are in service and you can expect Emily to replace all coast guards, navies and ocean rescuers in the near future. It is not Iron Man or Super Man came to rescue us, but it’s Emily who is getting the job done. Now that’s a tale to tell! Like you, I was amazed to know about this inspiring story. And no wonder the era in which we would walk around the streets with robots is not very far from now. Already a lot of industries had started to use robotics within their operations to improve efficiency and avoid risks & accidents. From the robots that deliver goods to our doorstep to the ones that do the rescuing work at the disaster hit zones, all of them are now a reality and it is also a high time for us to develop knowledge on robotics as soon as possible to cope up with the trend. 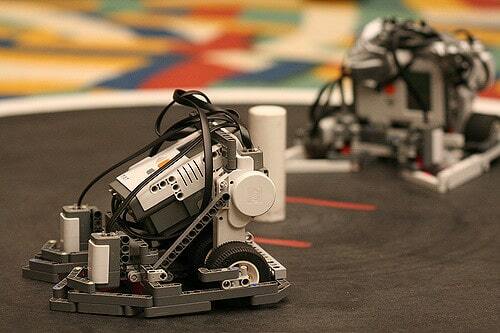 So, what’s the first question that come to your mind to learn robotics? “How to make a robot?” isn’t it? Yes, it is a question that looks rather simple but tough to answer. So, in this article I am mentioning the steps and procedure that will help you in making your very own robot. Raspberry Pi: It is one of the advanced microcontroller board available in the market that facilitates easier building of innovative robotics projects. Raspberry Pi is actually a miniature size computer that can be used to build complicated robotics projects also. This platform is not recommended for beginners as it involves complex architecture and programming. But if you had already done some basic programming projects and have some decent knowledge on Python Language, then you can opt for this platform. This particular platform would provide you a lot of bandwidth to modify your robot to perform various functionalities. If you are beginner and aspiring to build your very own robot for the first time, then we would suggest you start with Arduino. As its architecture is simple to understand and programming language is easier to implement, using this platform will make it easier for you to build a robot. Manual: These are the type of robots that need to be operated manually. Manual robots cannot operate on their own and will need step by step instructions from a user to facilitate the actuation. Crane is an excellent example for this category. Semi-autonomous: These are the types of robots that take some inputs from the user and performs the tasks on their own. These are not same as manual robots, because step by step instructions are not needed to make the robot work. Mobile or Gesture or Bluetooth controlled robot is a very good example for semi-autonomous robot. Autonomous: These are the types of robots that can perform all their tasks completely on their own with zero human interaction. These types of robots will be embedded with sensors that can detect and guide the robot’s actuation/motion with the help of a microcontroller. Fire Fighting Robot or Edge Detection Robot is a very good example for the autonomous robot category. You can choose the type of actuation that you wish to implement on your robot from the above types. For instance, we at Skyfi Labs have developed various manual, semi-autonomous & autonomous robotics courses that makes building robots super easy for anyone across the globe. Upon confirmation of the platform and the actuation system for your robot, it is now time to check and get all the components that are needed to build your robot. First make a list of all the components that are needed to make your robot. You can search for that specific robotics project online or refer some videos, articles or journals to get some idea about the components that are needed. If it is a standard component, you can order for the specific component at online stores and get it delivered to your doorstep. But mostly the robotics projects involve a variety of components which might not be readily available at online stores, so you need to visit some hardware shops in your locality and search for the components manually. But there is also a great risk that the components that you get in local market might not work properly as you have no way of testing them before you purchase. The parts also might not function well with each other. So be very cautious while buying the components in electronics markets, as they don’t come with any guarantee too. If you are puzzled about the place where you can get quality hardware components, you can always order robotics kits from Skyfi Labs. The robotics hardware components that we send are well tested and come with a 100% output guarantee. Once you have all the components, you can start fabricating your robot. You can refer some online tutorials or online forums to get the fabrication procedure for your robot. But proper care should be taken while fabricating your robot, as any wrong connection of electronic components will short circuit or damage the development board. If damaged, there is no going back. You need to replace all the components with new ones to make the robot work. So always resort to some reliable resources to get the necessary guidance as and when needed. Upon completing the fabrication of your robot, now it is time to power up the brain of the robot which is the microcontroller. You need to first come up with the programming logic to carry out a specific robotics action. Moreover, depending upon the platform that you chose, the programming language will vary. For example, you need to use C++ language for Arduino, Embedded C language for 8051 and Python language for Raspberry Pi. Instead of writing the programming code directly, first identify the logic to be used to make the robot perform a specific task and then start writing the entire code. You need to have some software downloaded to your system to facilitate the dumping of program onto the microcontroller. For example, IDE software is needed for Arduino based projects, Anaconda software is needed for Raspberry Pi projects etc. Even we at Skyfi Labs take special care while developing the programming modules for our robotics students. Since programming is the most important step involved in making a robot, any small discrepancy would lead to malfunction of the robot. After writing the program code, you can export it to the microcontroller to check for the working of the robot. Generally, you will get some error in the beginning. Just note down the errors and then modify the program code or calibrate the sensors to make the robot work efficiently. This process should be repeated till you arrive at the proper functioning of robot. This might be time taking and pain stacking, but trust me, the learning that you get during this step will make you master the programming language. After this, you will develop a very good expertise to program various robots all by your own. Hope you got a brief answer to your question – How to make a robot? I am a beginner, not sure how to start. Will I be able to succeed on making the robot all by my own? Any tips? Since robotics involves latest technical concepts and complex components, being an amateur you will find it difficult to get started with robotics initially. But once you had built 2-3 robots, you will develop a good understanding on this technology and will be able to build more robots all by your own from then. So we strongly recommend you to get expert assistance to build your initial robotics projects and develop a strong expertise. You can enrol into some robotics courses to get started. These courses come with quality kits and course content, so you wouldn’t face any problem in building your robot. This will surely boost your confidence and give you the necessary robot building experience to get going on your own. But remember, the robotics course that you are enrolling should offer a good learning experience in addition to helping you build robots. So take proper care in selecting the course, as there are a number of companies in the market that offer robotics projects citing the demand but don’t really provide learning opportunity for you. You can simply go through the company’s credentials by checking their Google/Facebook reviews, social media presence etc. and then enrol into the course. Do reach us at 1800-200-3855 or info@skyfilabs.com to get some assistance. We wish that you will have a great learning experience building robots all by yourself. But, if you are still unsure where to find resources or materials to build robots, do not worry. we at Skyfi Labs will always be there to assist you on this. Keeping the above steps in mind, we have developed some amazing robotics courses which are super fun to do right from your home. With the robotics kits shipped to you in 24 Hrs and the course access provided, building robots will never be tough for you. Do comment below with your suggestions and recommendations.